Taylor Harris feels confident about her job prospects. A senior at Howard University in Washington D.C., Harris hasn't yet landed her first job yet but she's hunting. She is the editor-in-chief of her school newspaper and aspires to be a journalist. "I'm a little bit more confident than seniors from last year," says Harris, 22, of Dallas, Texas. This year's college grads have good reason to feel a notch better -- the unemployment rate for recent college graduates is 5.6%, the lowest rate since June 2008, according to a new report published Thursday by the Economic Policy Institute, a left-leaning research group. New graduates have been taking it in the chin during the Great Recession and in the years after. They have been stereotyped as unemployed or underemployed -- the college grad baristas -- for being unable to find jobs that would use their four-year degrees. That situation is improving, but not enough. A lack of quality jobs that pay well continues to plague newbies in the job market. Add to that the burden of skyrocketing college costs, and it's a tough situation to be in. "The bottom line is that for recent college graduates, finding a good job has become much more difficult," EPI's researchers say. EPI's report also shows that significant gaps in employment and wages persist across race and gender lines for young college grads. For white college grads, the unemployment rate is 4.7%. For black grads it's 9.4%. The unemployment rate for black graduates has declined along with the improving economy, but it's still higher than the peak rate (9%) for white college grads during the recession. Harris, who is African American, says she faces those challenges first hand. She has interned at the Dallas Morning News, The Washington Post and U.S. Army's public affairs office during her college years. That's on top of managing a college newspaper and going to class. 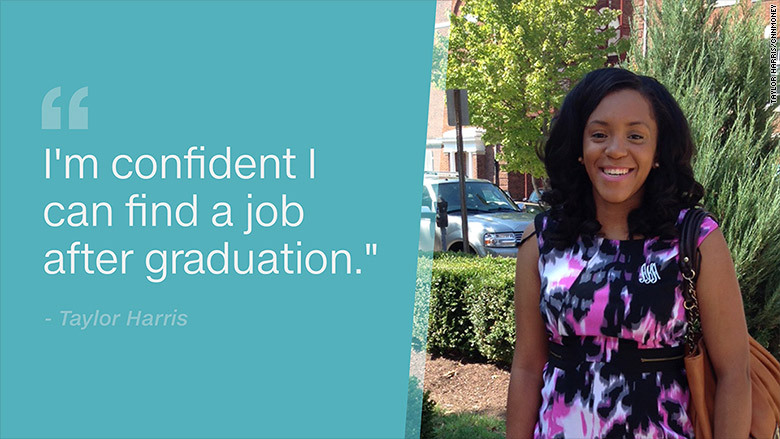 "Being a black job candidate, I think you have to work twice as hard sometimes just to get a job," Harris told CNNMoney on her way to take a final exam. "It's not enough to just get a bachelor's degree, you have to be active in college with internships, fellowships and jobs in order to compete." Gaps persist also on gender lines. While the unemployment rate for men and women is the same, their earnings are far apart. Young male college grads earn about $21 an hour while young female grads pull in only $16.58. That gap has widened since 2012, EPI research shows. Meanwhile the cost of college has skyrocketed. Between 1984 and 2015, the cost of a 4-year college degree at a public university has shot up 125%. And between 2004 and 2014, there was a 92% increase in the number of student loan borrows, according to the New York Federal Reserve. So new graduates are under a lot of pressure to take whatever jobs come their way. One in eight college graduates is underemployed -- that is, working a job that doesn't require a college degree or the skills they've obtained. And overall wages have grown less than 1% for young college grads since 2000, when adjusted for inflation. Harris has applied to graduate school because she felt a bachelor's degree might not be enough to pursue her journalism career. She was accepted into a master's program at American University, but she's asked to defer for a year so she can test the job market. The challenges new college grads face aren't dampening her outlook. "You have to be aware of the statistics to beat them," Harris said.